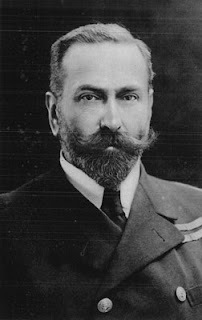 Ludwig Alexander (Louis) von Battenberg, later Marquess of Milford Haven, grandfather of Prince Philip and great-great-great-grandfather of Prince Louis of Cambridge. Photo: Wikimedia Commons. I haven't got into details with all the title creations and renunciations, as that is not the most important here, the main point is of course the name Ludwig and Louis. And yes, there are many more examples in the family. Baby Prince Louis has an elder brother whose third name is Louis, while Louis is their father's fourth name. Prince Louis' second name is Arthur, which is also the second name of Prince William and the third name of the Prince of Wales. Baby Prince Louise's third name Charles is of course after his grandfather, the Prince of Wales. Charles is also Prince Harry's second name. Arthur was also King George VI's third name and of course the name of the seventh child of Queen Victoria and Prince Albert. And we could go on and on with many more examples. Once again the Duke and Duchess of Cambridge have picked a traditional royal name within the extended British royal family. Louis was not the main favourite of the bookmakers, but was mentioned as a possibility. I was more surprised that they didn't include a name from Catherine's Middleton family. Actually, you have to go back to her ancestor no. 12, i.e. her great-grandfather, to find the first example with one of the youngest son's three names, i.e. Stephen Charles Goldsmith (1886–1938), and as far back as no. 144 (seventh generation) to find the first encounter of Arthur – Arthur Lupton (1747/48–1807). We are of course talking about known ancestors. There are some gaps in the ancestry table. I haven't found any ancestor named Louis in the book I have used as a source for the last paragraph, The Ancestry of Catherine Middleton, by the late William Addams Reitwiesner. Then again, I certainly don't think William and Catherine used the ancestry book to find names for their youngest child! Updated last time on Saturday 28 April 2018 at 17.00 (minor changes to Ludwig Louis list). Royalty Digest Quarterly no. 1, 2018 arrived just in time for Easter, but with so many books and magazines on my reading list, I didn't finish reading it until this week. 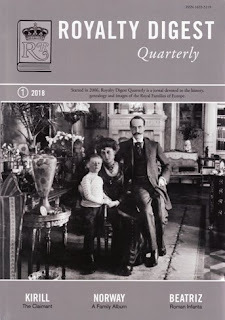 Is this the first time King Haakon VII, Queen Maud and the then Crown Prince Olav has been put on the front cover of the RDQ? I think so. The cover photo also reveals that it is the Royal House of Norway's turn to be treated with A Family Album, a series authored by the magazine's historical consultant, Charlotte Zeepvat. As usual she provides an introductory to the history of the Norwegian monarchy before the album starts. All in all there are 54 illustrations of the various members of the Norwegian royal family and some of the estates connected to them. The genealogical table, most likely provided by Ted Rosvall himself. only covers one page this time, starting with King Haakon VII. A few minor mistakes though. The Bernadotte Descendants author always insists on writing «Beckmann» with two n's instead of the correct spelling, Beckman (surname of Elisabeth Ferner's former husband) with one n. Not sure why. And yes, I have commented on this before. And there is no hyphen in Märtha Louise. Minor trifles, yes, but considering the size of the survey it should't be too difficult to get it right. There is more about the history of the Norwegian monarchy in this issue, as Trond Norén Isaksen has written the article From Patriotic Desire to Colonial Stigma. The Viceroyalty of Norway, 1814–1891. Isaksen provides a short summary of the article in his own blog. But back to the beginning. In his Editor's Corner Ted Rosvall has this time decided to write about ... Ted Rosvall ... and rightly so! In late January 2018 Rosvall went to the Royal Palace in Stockholm to receive the Royal Golden medal «for his meritorious efforts as a genealogist and an intermediary of culture» from the king. So well deserved! The HM The King's Medal is divided into several classes, the medal Rosvall received was, as far as I understand it, the «8th size gold (silver-gilt) medal worn on the chest suspended by a blue ribbon». In the series Little-known royals Coryne Hall gives a glimpse into the life of Princess Dagmar of Denmark (1890–1961), who married Jørgen Castenskiold (1893–1978) in 1922. Dagmar was a younger sister of King Christian X of Denmark and King Haakon VII of Norway. John Wimbles (1935–2015) was well-known for his collection of letters and other material from among others the Romanian National Archives. David Horbury has in a seven-part series called Half a Century of Royal Letters; 1899–1946 compiled excerpts of letters from and to various members of the Romanian royal family. The present issue provided the 7th and last part. Finally the column The World Wide Web of Royalty returns with genealogical news, this time including the Imperial, Royal and/or Princely houses of bavaria, Bourbon-Parma/Austria, Denmark, France, Hannover, Hohenzollern and Serbia. The Spring edition of American Ancestors, the periodical of the New England Historic Genealogical Society (NEHGS), was published earlier this week. It provides a guide to the Mayflower 400th Anniversary, which takes place in 2020. The English ship Mayflower arrived in what is today known as Plymouth, Massachusetts in 1620 with 102 passengers (know today as «the Pilgrims») and a crew of about 30 people. The 68 pages special edition is packed with information on various events taking place during the anniversary year and articles covering different aspects of Mayflower history, including Notable Mayflower Descendants. A List of 100, with sources by Gary Boyd Roberts. On the list one can find several presidents and first ladies, including Franklin D. Roosevelt and Barbara Pierce Bush, author Laura Ingalls Wilder, actors Clint Eastwood and Henry Fonda as well as Mormon founder Joseph Smith, to mention a few. The contents can be read here. There is so much history to explore, so I look forward to reading the edition in full. Photo: © 2016 Dag Trygsland Hoelseth. Mayflower II, a copy of the original ship. It was built in 1957 and is currently under renovation. The photo was taken during my visit to Plymouth in 2016. The Norwegian Royal Court informed earlier today that King Harald V is on sick leave for the rest of the week due to a strain and pains in one of his feet. The court added that during the time the king is on sick leave, the Crown Prince will serve as regent in accordance with the Constitution Article 41. This is not entirely correct, however, as the Crown Prince is currently paying an official visit to Estonia, which means that it is the the Council of State, i. the Government, which «will conduct the administration of the realm» until the Crown Prince returns on late Thursday 26 April. Her Royal Highness The Duchess of Cambridge was safely delivered of a son at 1101hrs. The baby weighs 8lbs 7oz. The Duke of Cambridge was present for the birth. The Queen, The Duke of Edinburgh, The Prince of Wales, The Duchess of Cornwall, Prince Harry and members of both families have been informed and are delighted with the news. Her Royal Highness and her child are both doing well. If you wonder about the weight, 8lb 7oz = 3.827185 kg. As far as I know nothing has been said about the baby boy's length. The «Notes to the editors» part, which was not published by Kensington Palace's Twitter account, but found its way to among other Sarah Hewson of Sky News, said that the medical staff in support were Mr. Guy Thorpe-Beeston, Surgeon Gynaecologist to The Royal Household, Mr. Alan Farthing, Surgeon Gynaecologist to HM The Queen, Dr. Sunit Godambe, Consultant Neonatologist at the Imperial College NHS Trust and Professor Huw Thomas, Physician to HM The Queen and Head of the Medical Household. The notes meant for the editors said that «The name of the baby will be announced in due course». As I didn't have the time to blog yesterday, I had hoped to write a combined birth and name article today, but obviously we are still waiting for the name to be announced. Hopefully I can return with a follow-up tomorrow. 23 April is St. George's Day, so if the name had not already been taken by the baby boy's brother, George would have been an obvious choice. The favourite of the bookmakers is Arthur, followed by Albert. Other names being mentioned are James, Philip, Alexander, Henry, Edward. Frederick, Thomas, Alfred, Jack, Louis, Michael, Charles and William. The Duchess' father is named Michael, by the way, while her grandfathers were named Peter and Ronald respectively. Philip after Prince William's grandfather would be a good choice, but the Duke and Duchess might want a name which is not taken by a living member of the royal family. Now I am of course talking about the call name. I would be surprised if Michael isn't chosen as the second or third name, but I would be equally surprised if it is announced as his call name. Then again, it is very seldom that I get the correct answer in the guessing game ... My choice would be Alfred Michael Philip (or maybe Alfred Philip Michael sounds better? ), but I guess Arthur is more likely. We all seem to guess on a traditional royal name, as with George and Charlotte, but for the third child the Duke and Duchess might feel less tradition-bound? The most popular male names in 2016 can be found at the website of the Office for National Statistics. Thomas and Robert should definately not be ruled out, but I just cannot imagine names like Oliver, Noah, Logan, Mason, Finley or Harrison. The new-born Prince of Cambridge entered the world as no. 5 in the line of succession to the British throne. A point to be made her is of course «in the old days» the new prince would have pushed his elder sister Charlotte down the ladder. But the Succession to the Crown Act 2013, which applies to «a person born after 28 October 2011» and which came into force in full on 26 March 2015 (to be more exact: «The day appointed for the coming into force of the Succession to the Crown Act 2013, so far as it is not already in force, is 26th March 2015»), secured Charlotte's position in the line of succession ahead of any younger brother. So we can say that history was made yesterday. Another point is that yesterday's royal birth meant that the Duke of York was pushed down to no. 7 in the line of succession and does not need his mother's consent to marry again if he so wishes. He could therefore remarry his ex-wife, as so many have speculated on. I am not convinced, however, that the Queen, under such a scenario, would have refused consent if it was still needed. The Duke of York might be content with the present status after all. Kensington Palace might have published something similar in connection with the births of Prince George and Princess Charlotte for all I know. Regardless, I like the stand the couple has made.